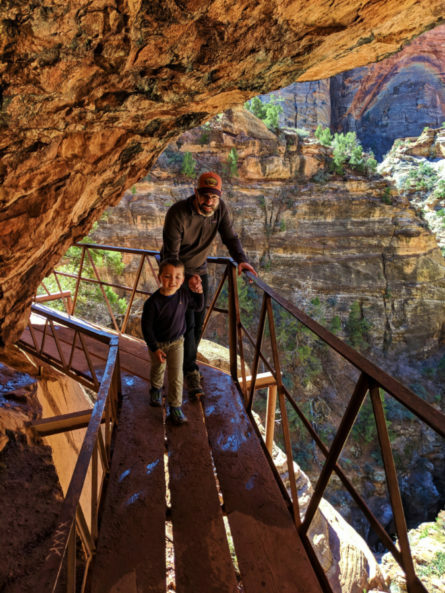 Zion National Park is known for its epic hikes and canyoning routes, but it’s also full of fun hiking trails that are great with kids too! 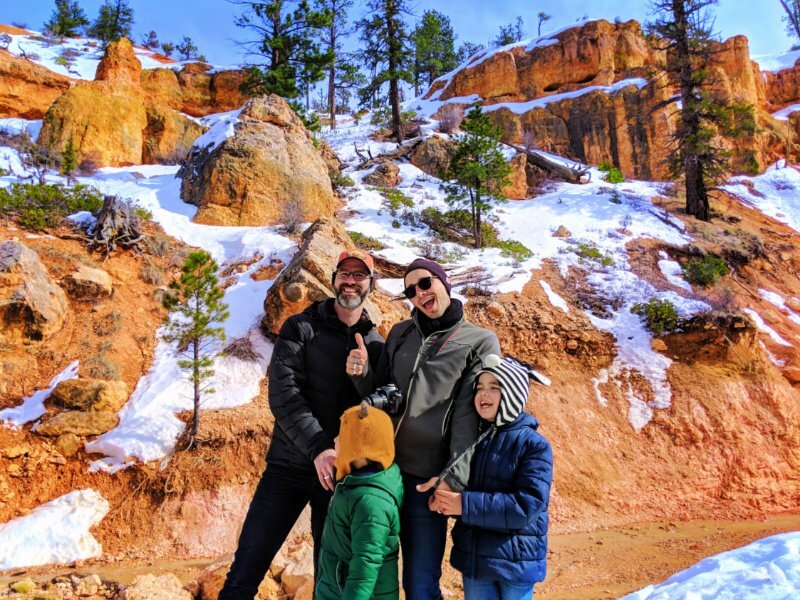 By now you’ve seen that we really love Zion; we found that the scenery paired with the activities make for a perfect family vacation destination. 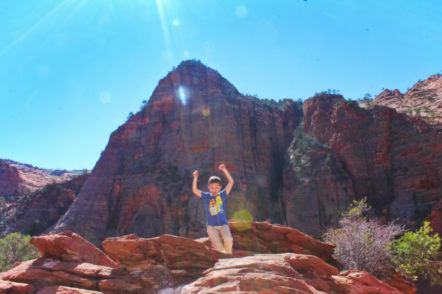 And that’s what we’re talking about here: best kid friendly hiking in Zion National Park. 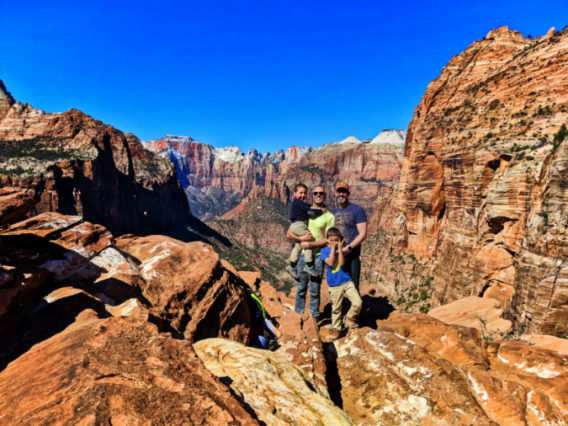 If you are looking for epic views or easy strolls, there are plenty of kid friendly hiking options in Zion. 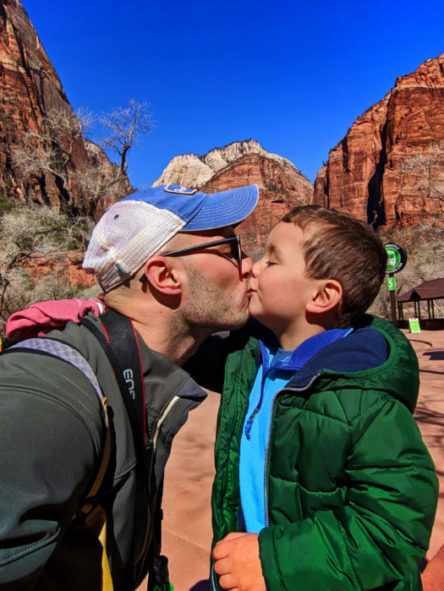 You truly don’t have to over-exert yourself (or your kids) to experience and appreciate the best of what Zion has to offer. 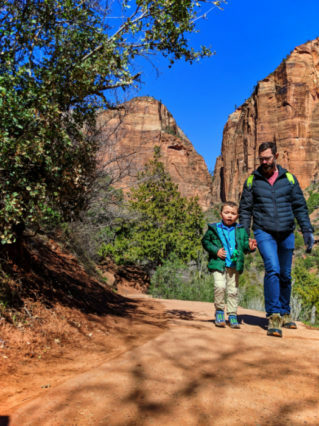 These are our top picks for families and safety tips for some kid friendly hiking in Zion National Park. As long as you follow those simple hiking safety tips you should be good to go. Keep in mind the skill and fitness level of those you’re hiking with. Even though it’s good to push yourself when you’re healthy and prepared, that is difficult to gauge with others. 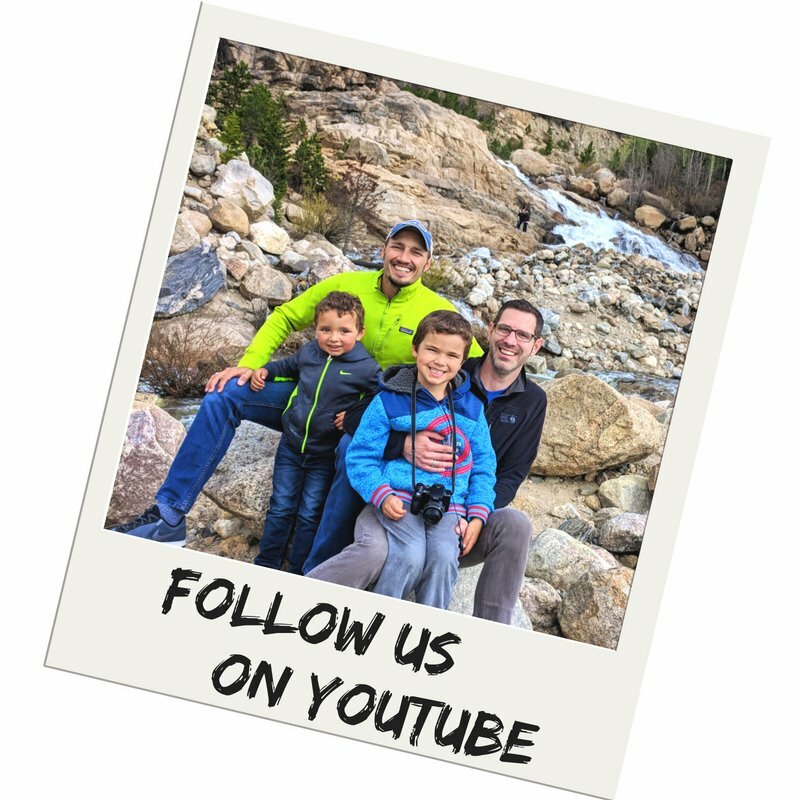 Check out our full article on Hiking Safety for more tips and ideas. 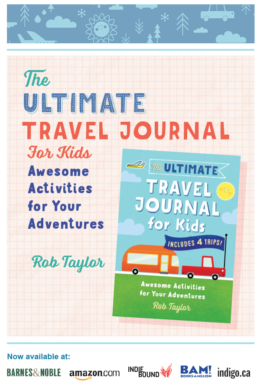 Leave the iPads at home. You’re in nature. Kids’ hiking backpacks are just as important as adult hiking packs, and even more so at times. We like to be sure that at least one of our kids has a backpack with some provisions in it. It gives them a sense of purpose and they feel like they’re just as much of a participant as the adults, not just dragged along on a hike. This easy packing list applies to hiking nearly everywhere, but particularly in mountain National Parks. Tough trails, high elevations and jaw dropping views need to be supported with preparedness. You’re welcome. The moment you’ve been waiting for!! 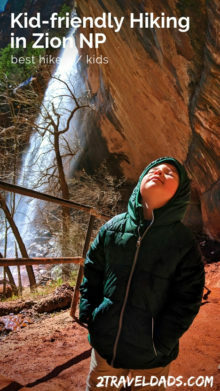 What are our actual recommendations for kid friendly hiking in Zion National Park? Here you go! 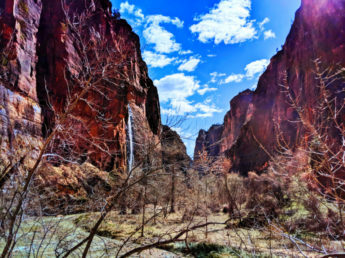 These suggested Zion hikes are noted for their level of difficulty, length and ultimate selling point. We’ve done each of these, and the ones we haven’t we note as such. 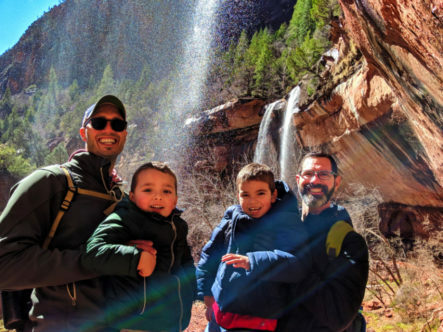 This is the first-hand list from a parent of small kids what hiking in Zion is good for the whole family. Download Zion National Park hiking guide here. 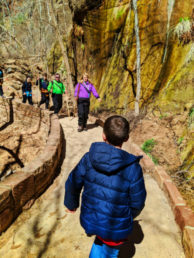 All of the following kid friendly hikes in Zion are accessible from one of the Zion Shuttle route and are open nearly all year. 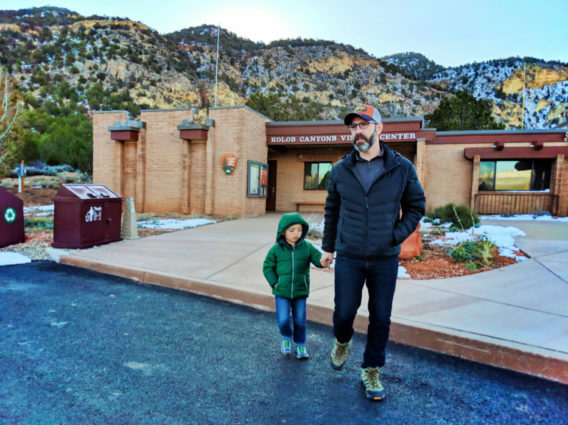 Trail availability is dependent on weather, both current and recent, so double check at the Visitor Center regarding which trails are open for the full route you’re interested in. 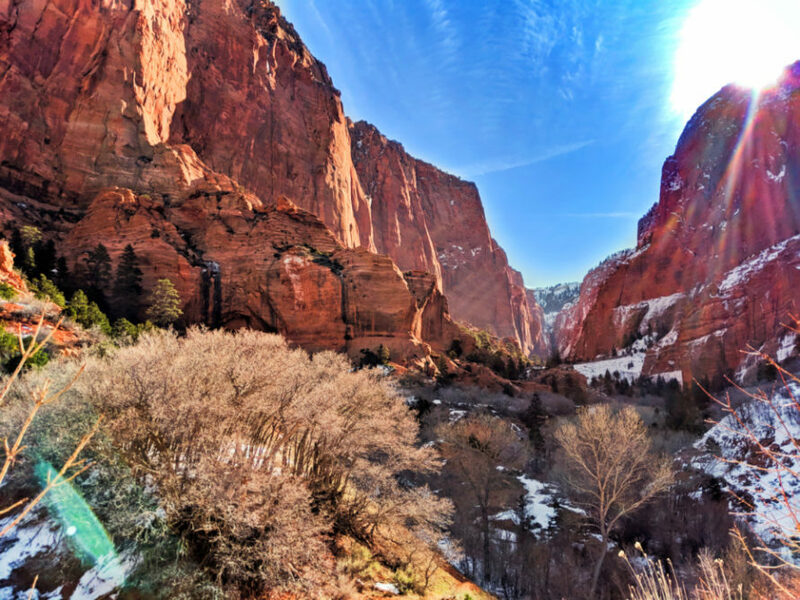 The Pa’rus trail is the very first trail you’ll encounter at the main entrance to Zion National Park. 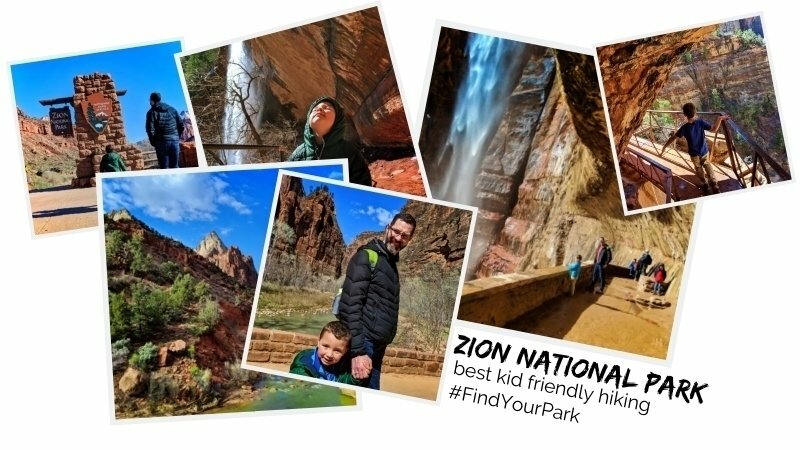 Fitting that it’s our first recommendation for kid friendly hiking in Zion. The Pa’rus trail begins at the Visitor Center and goes as far as Canyon Junction. It’s a pretty mellow hike and is even wheelchair accessible for the 3.5 miles along the river. This is a busy trail though, as it’s one of the few that dogs and bikes are allowed on, but it’s beautiful and if you don’t have a ton of time but want to experience a taste of Zion, this is ideal. This is a fun, relatively easy trail. It’s not too long, but is long enough to make you as an adult feel like you’ve accomplished something. The payoff at the end of the trail is worth it too. 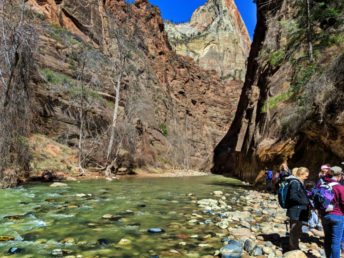 You begin the Emerald Pools trail at the Zion Lodge and cross the Virgin River immediately. As you hike along, watch for BOLD ground squirrels, cactus right off the trail and impromptu waterfalls. You’ll get different trail bonuses depending on the time of year. The trail itself is actually paved a good portion of the way to Lower Emerald Pool, but when it stops, the trail is pretty iffy. After a bit of rain or snow melt, the last quarter of the Emerald Pools trail is pretty muddy. While there are no crazy cliffs and the trail is pretty wide, we do recommend holding kids’ hands for this section if the trail is gross. Let’s just say the mud here is straight from Willy Wonka’s chocolate waterfall. The big sight of the Emerald Pools trail is walking behind waterfalls. 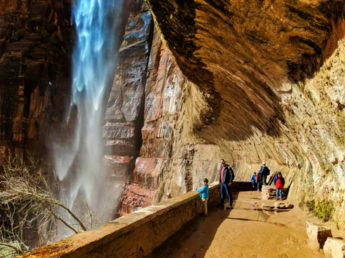 That’s why this is one of our picks for kid friendly hiking in Zion National Park. The splash down and subsequent lush vegetation makes for a unique and beautiful sight, easy to talk up for kids. 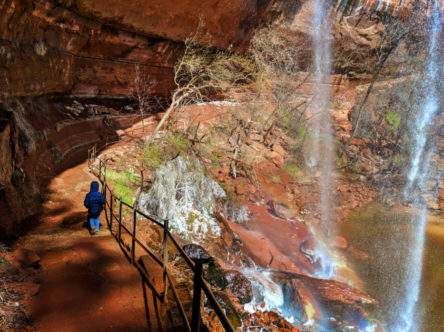 Note: the loop portion of the Emerald Pools trail that continues to the other pools and sights is currently closed (as of April 2019). Normally this would connect to the Grotto trail which ends at the Grotto Zion Shuttle stop. 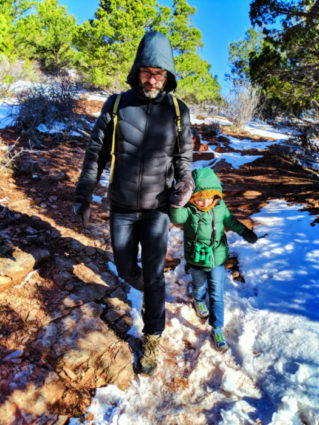 Easiest kid friendly hike in Zion National Park, hands down. At a mere quarter of a mile from shuttle stop to trail end, it’s an fun and easy adventure with kids. The trail crosses a bridge to start and then continues up the hill to the cliff wall. There are lots of vegetation markers along the way, so for any worldschooling kids or interested adults there are lots of learning opportunities as you hike. At the near-end of the trail, you reach the viewing platform of the actual Weeping Wall and waterfall. The “weeping” happens when water trickles down through the water table and then hits an non-porous rock. It has to go somewhere to seeps out of the sandstone wall. This causes moss, ferns, and all kinds of lichen to grow on the rocks, making it a lush and colorful sight. Continue on to hang out behind yet another waterfall and enjoy the view back down through Zion Canyon towards the main entrance. 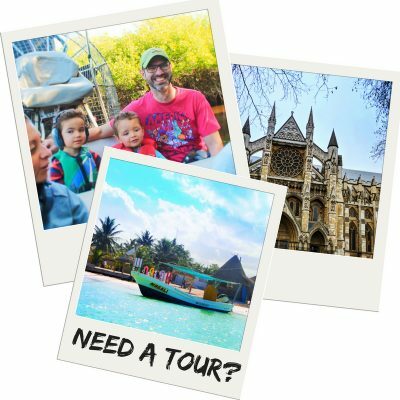 This is a great place for family photos and even a small picnic if you’ve brought it along. Note: since the trail goes behind a waterfall and its main feature is a slow flow of water through the rocks, expect to get a little bit muddy and to be mindful of mud-stomping kids. After you visit the Weeping Wall, you’re already set up for our next recommendation: Big Bend. 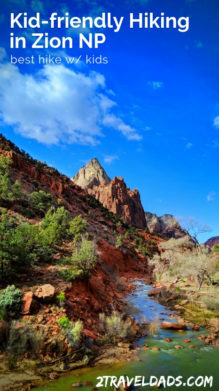 This is primarily a shuttle stop in the Zion Canyon but is a great option for kid friendly hiking. 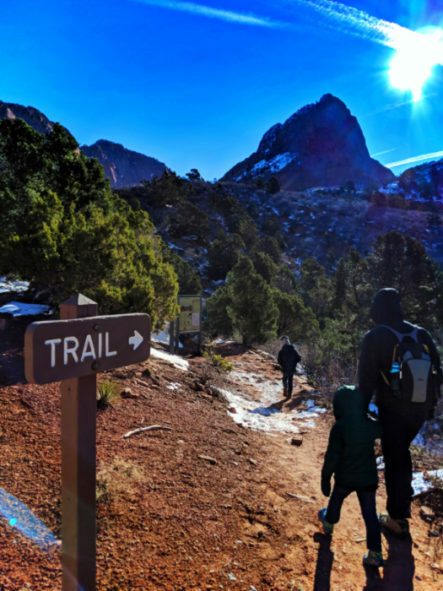 You can access the trail head here either by hiking from Weeping Wall or by getting off the Zion Shuttle and walking down the hill. Big Bend is an interesting area as you see the Virgin River cut even more through the canyon and take a big turn, or bend. The hiking trail here is extremely level and follows the path of the river. This trail is NOT stroller or wheelchair accessible, but on foot it is fairly easy. 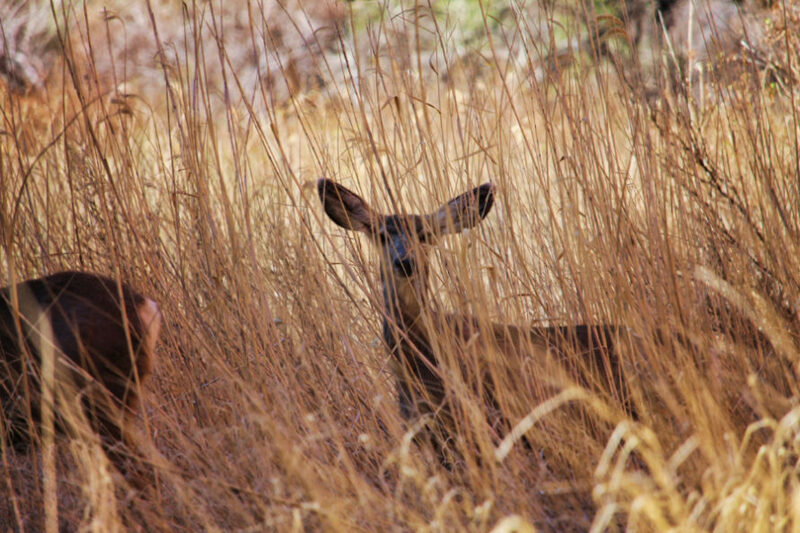 Highlights of the Big Bend trail (actually an extension of the Paras trail) are the sheer sandstone cliffs above, seasonal waterfalls pouring into the river, and a seemingly resident herd of black tail deer. If you want to do a meadow picnic with an awesome view, the Big Bend trail is the spot for it! You access the Riverside Walk trail from the very last shuttle stop at the Temple of Sinewava. There are restrooms at the beginning and a spring water pump, so if you have already been exploring the park, take a moment to refresh and then hit the trail! I’d like to say that the east side of Zion National Park was void of visitors, but it’s not. 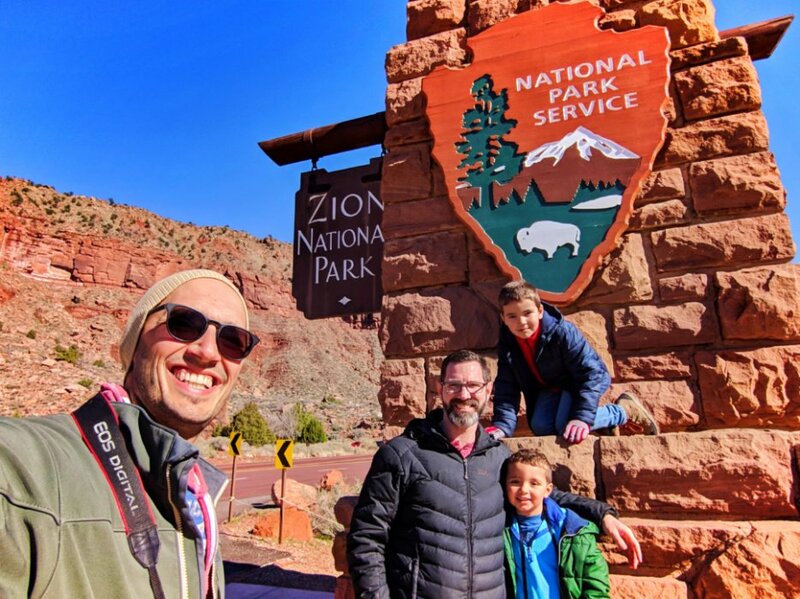 It for sure has fewer visitors than the primary Zion Canyon area, but still is very popular. This part of the park doesn’t have shuttle service, so you must drive. This will take you through the Mt Carmel Tunnel, which is an epic feat of engineering. There really is only one hike on the east side of the park that we’d recommend with kids, and it’s awesome. This was our favorite hike in Zion National Park. While the first impression of the trail is daunting with scaling a cliff right off the bat, the trail itself is actually very easy. If you’re deathly afraid of heights or have no sense of adventure, this trail is not for you. But here’s the thing: our 4 year old did it and loved it. Canyon overlook is on the east side of Zion National Park, just before the 1.1 mile section of the Zion-Mt Carmel Tunnel. Parking is along the road on the east side of the tunnel with 4 different small parking sections. If you arrive late morning you may have to park far away and walk along the road, but there is enough room to do it safely. 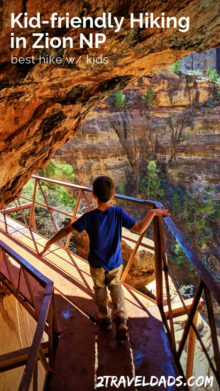 Tip: always hold hands, both when you’re walking to the trail head AND when you’re on the actual Canyon Overlook trail. 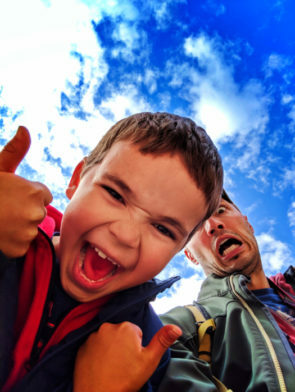 Keep kids on the inside to provide a safety buffer and sense of security. Once at the trail head, you start up the switchback trail to a point where it evens out. The views get more and more interesting as you go, moving on cliffsides, crossing boardwalk overhangs, and hiking through a shallow cave. 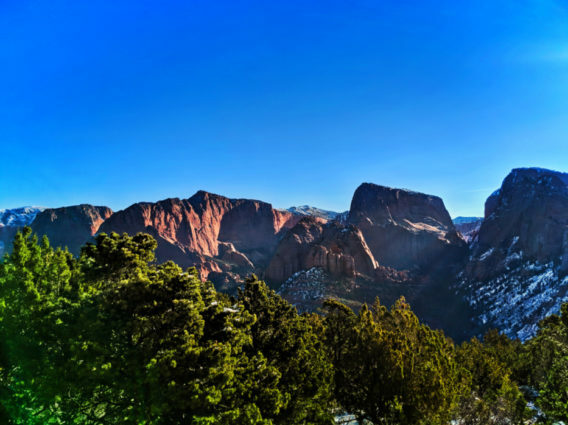 When you reach the end, the view is stunning with an unobstructed vista of the east side of the V-shaped Zion Canyon. Note: when you reach the end, there is an obvious viewpoint, but you’re welcome to scale the rocks a bit for some additional views and rock formations. THERE ARE NOT GUARDRAILS outside of the primary viewpoint. BE AWARE OF YOUR SURROUNDINGS. 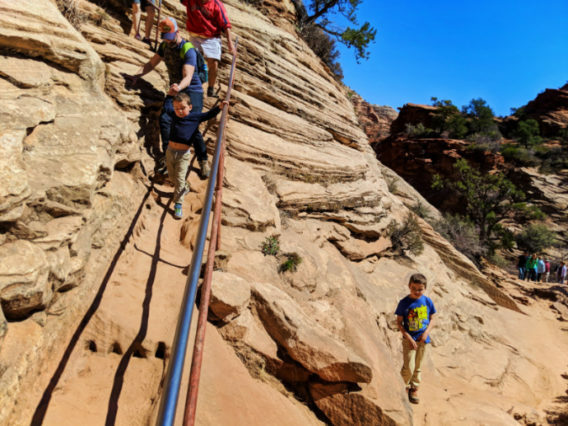 I know that was a big warning, but this trail still is considered kid friendly hiking in Zion National Park and an aware parent will be fine to bring their children on this hike. Tip: be sure to ask a stranger to take a family photo at the end of the hike. 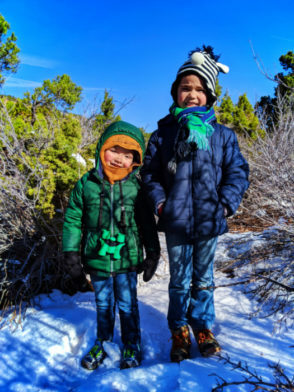 You’ll want something to remember this unique, fun hike with the kiddos. 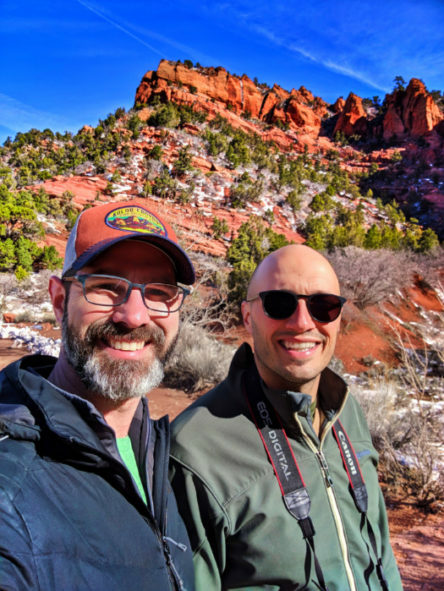 Kolob Canyons is an incredible area. It’s very different from the main Zion Canyon and has some wonderful trails. 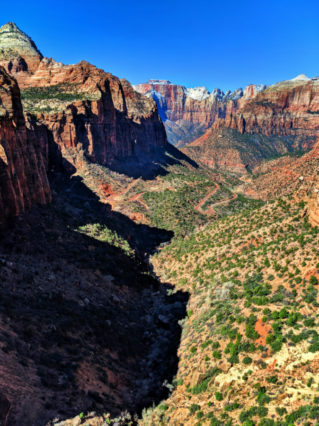 This part of Zion National Park is much less visited, but the hiking is also much more intense. It’s worth planning a day for one of the longer hikes, but we honestly recommend it for families with older kids. It’s amazing, but a tough area. 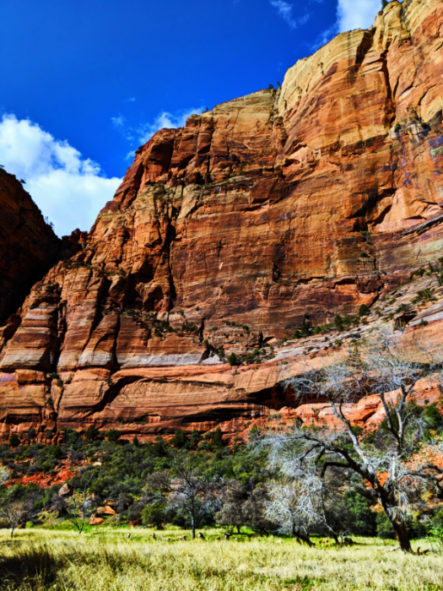 This is the easiest trail in the Kolob Canyons area of Zion National Park. It’s at the end of the road and is a short 1 mile trek up the hill. The view at the end of sweeping and amazing. 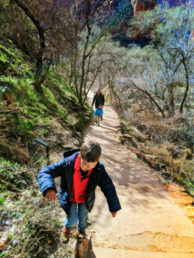 The trail is rocky, but it’s so short that taking it slow makes it some of the best kid friendly hiking in Zion. For the best view, do the Timber Creek Overlook hike in the late afternoon. It may be toasty in the summer, but the light on the canyon walls will be amazing. This is one of those spots that if you have hardy kids you can do it. 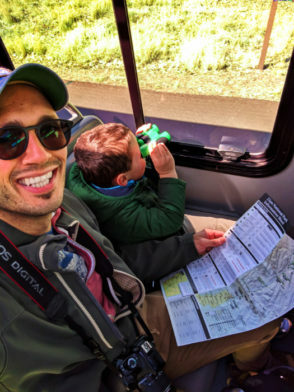 The hike is 5+ miles, so it’s best with older kids or if you have little ones in hiking packs still, but it’s pretty cool. This trail will take you past some old homestead cabins and to Double Arch Alcove. If you do this hike you basically get a great preview of an arch that will be free standing in a few thousand years or longer. We didn’t complete this trail with the kids because it was an intense trail and is really a long hike. The views with each hill you crest are gorgeous, but it’s really a workout. This hike is appropriate for adult groups and families hiking with teens. 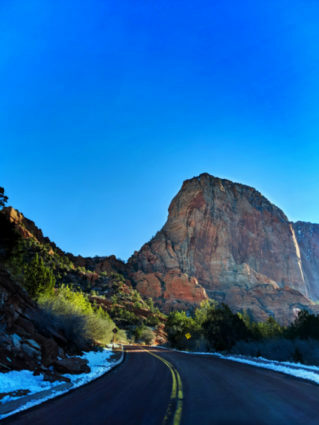 If you can handle it, it’ll take you all the way to Kolob Arch, which is one of the largest free-standing arches in the world. When the kids are older, we’re going to conquer the rest of this one! 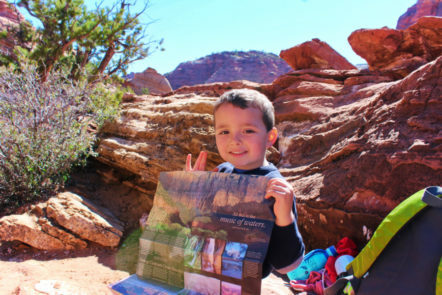 As you can see, there really is a lot of kid friendly hiking in Zion National Park. 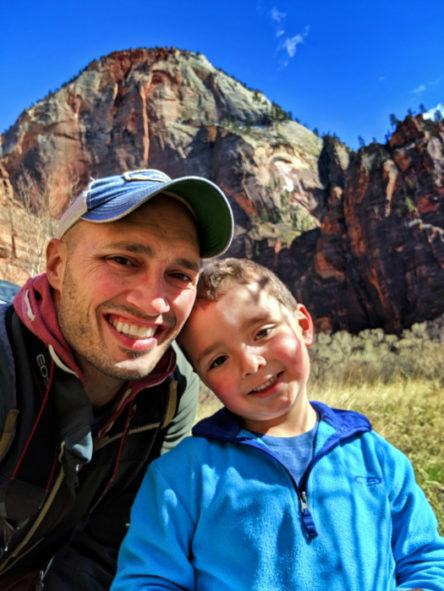 If you’re visiting without littles and you’re in great shape, feel free to check out the Narrows, Angels Landing, Kolob Arch and more. They are genuinely intense hikes, but well worth the time and effort. Please let us know what questions you have and if you have additional recommendations. Send us a note or leave a comment! 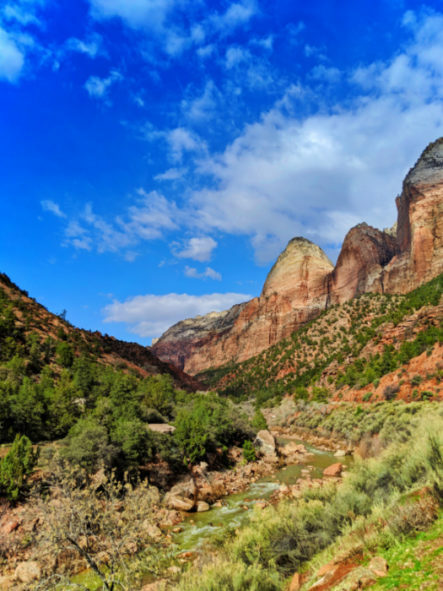 Be sure to check out our other Zion articles, including stress-free Zion, where to stay and dine at Zion NP, and our Southern Utah road trip itinerary. 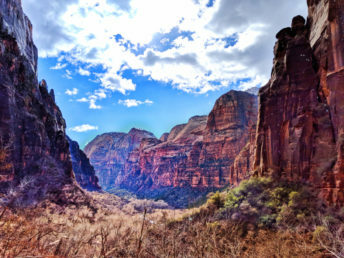 And want to pin this for your own hiking trip in Zion National Park? Go for it!! !